According to a new report from a research firm ABI Research, Apple's iPhone 5s is currently the world’s top selling smartphone. The second, the third and the fourth places in the rating are occupied by Samsung’s Galaxy S4, Galaxy S3 and Galaxy S4 LTE respectively. The last spot in the Top 5 ranking was given to the iPhone 4S. The rating is based on the data about sales of 20 most popular smartphones, including the handsets produced by Apple, Samsung, LG, Sony and Xiaomi. Samsung and Apple account for the majority of the top 20 smartphone models sold worldwide in Q1 2014. 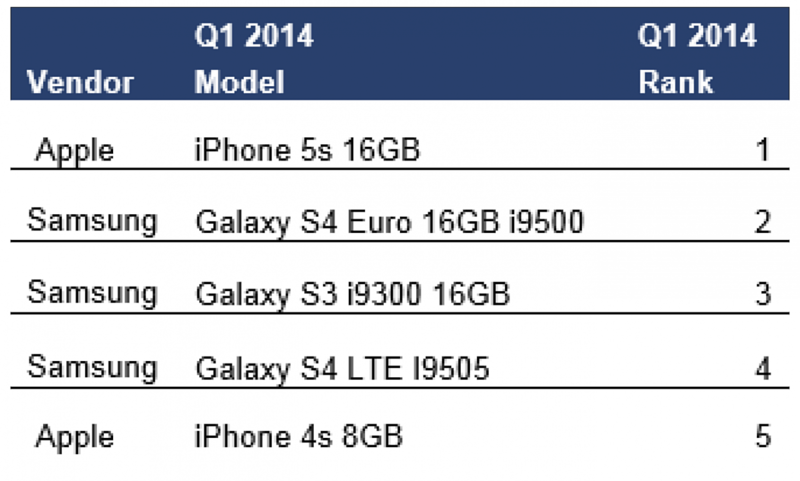 Heavily marketed flagship devices like the iPhone 5s 16GB and Samsung’s Galaxy S4 i9500 16GB top the rankings. Although Apple’s handsets remain the most popular among the customers worldwide, iOS market share is still lower than that of Android. Anyway, everything may change this fall, after the release of the 4.7-inch and 5.5-inch iPhone 6 and the updated iPad Air and iPad mini. These devices will likely boost the sales of Apple’s smartphones and tablets and, as a result, will improve iOS market share.